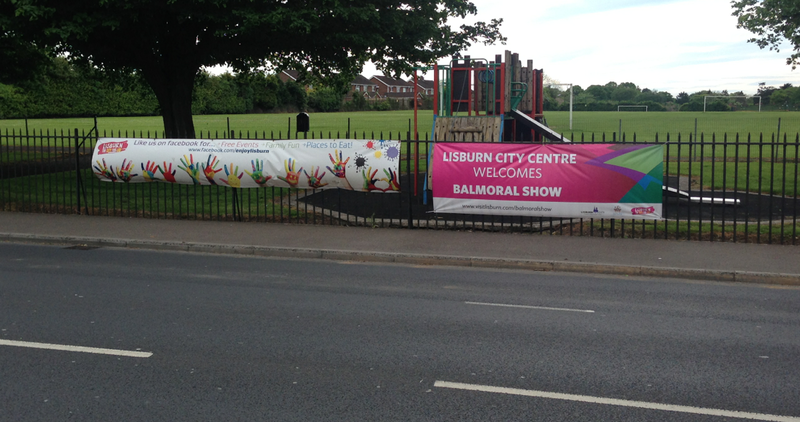 Weâ€™ve been very fortunate to work with the Lisburn City Council on their branding for the Balmoral Show for the last few years. From lamp post bollard printing to PVC Banners, weâ€™ve assisted with the printing of outdoor marketing materials including the bane you see above (the one on the right). Our PVC Banners are easy to install and remove, which is perfect for temporary and seasonal promotional activity such as The Balmoral Show or indeed the Giro Dâ€™Italia. They are perfect for locations that are not suitable for traditional signage or in which planning permission would not be granted. because of their value for money, PVC banners are one of the most cost effective alternatives to fixed outdoor signage. We use the the highest quality PVC and Mesh within all our banners and using the latest technology printing equipment and inks, they are suitable for outdoor use for over a year. Some of our banners have been used outside for many years without fading. About the Balmoral Show The Balmoral Show is Irelandâ€™s largest Agricultural and Food Show that entertains the whole family. Situated within the grounds of the Maze Prison, Lisburn, it attracts over 80,000 people during the 3 day annual event. Visitors travel from across Northern Ireland tp the show which is now in its 146th year because of its size, nature and extravaganza of colour. Days of competition and showmanship along with daily displays of pedigree horses, ponies, cattle, sheep, poultry, pigs and goats at are really the driving forces behind the crowds who visit the Balmoral show.